The Swachh Bharat mission (SBM) was launched on October 2, 2014 for a clean India in accordance with Mahatma Gandhi’s vision by his 150th birth anniversary in 2019. The union cabinet then gave its approval for restructuring the nirmal bharat abhiyan into SBM with two sub-missions – SBM gramin and SBM urban. The programme calls for elimination of open defecation, conversion of insanitary toilets to pour-flush toilets, solid waste management and bringing about behavioural change in people regarding healthy sanitation practices. The mission was proposed to be implemented over five years starting from October 2, 2014 in all 4,041 statutory towns in urban areas apart from the rural ones. 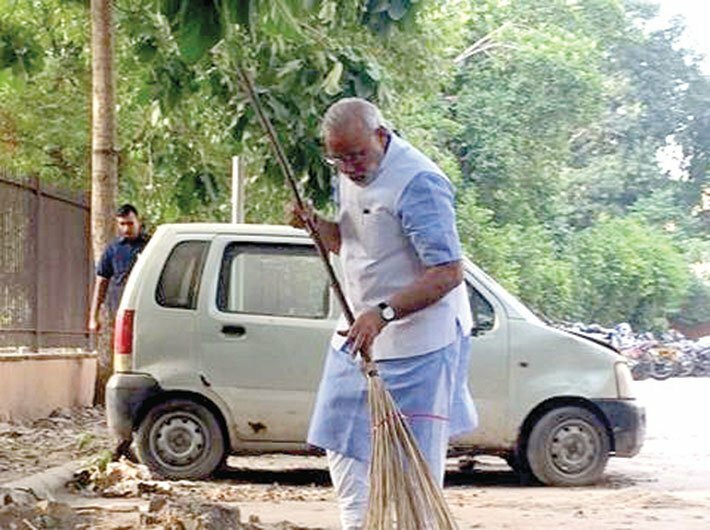 Ever since the PM announced the project, brand Swachh Bharat has been popularised by celebrities who joined the campaign and swept streets to create awareness. In India, where the burden of cleaning routinely falls on people from the lower strata, images of rich and powerful people weilding a broom sent a strong message – cleanliness is everyone’s duty. 2 percent Swachh Bharat cess was proposed on all service tax payments. Taking note of the 50 lakh toilets already constructed in 2014-15, finance minister Arun Jaitley said he was confident that the target of six crore toilets in urban areas would be met. Apart from several big companies who have already donated over '1,000 crore for the project, major corporate houses have committed budgets for projects linked to the campaign. Public sector companies, such as Coal India, ONGC, OIL, IOC and GAIL, earmarked funds for projects aligned with SBM. Also, the World Bank announced in January an aid of '240 crore in the next five years for building toilets in tribal areas and awareness campaigns. A big blow was dealt to the mission when only three of the 11 CMs turned up for the May meeting of the sub-group formed for the purpose. The meeting of the sub-group, convened by Andhra Pradesh CM N Chandrababu Naidu was attended only by the CMs of Karnataka and Haryana. It is alleged that non-BJP states are not keen on the programme as the centre launched the mission without consulting them. West Bengal CM Mamata Banerjee even went ahead and launched Mission Nirmal Bangla, bringing all the existing sanitation projects in the state under the scheme. Although, her Mission draws financial support from the plans sanctioned to states under SBM, the state government has set its own targets and administrative mechanism in place. The PM’s hands are tied when it comes to bringing all states on board. The scheme was to be implemented for rural areas by the ministry of drinking water and sanitation and for urban areas by the ministry of urban development. By the end of December 2014, SBM for urban areas was decentralised instead, with fully empowered urban local bodies (ULBs) and state governments tasked with taking the mission forward. The current status of disharmony between states and central government raises doubts about the efficacy of the central scheme. The project, which envisages building of at least 2 crore toilets in its first year, faces several challenges. Officials working on the project feel that the time, budgetary and manual resources to meet the deadline are inadequate. And so is the labour to build toilets and maintain them. Also, the project overlaps with at least 20 existing health and sanitation schemes and there is much uncertainty of distribution of funds. With existing resources, the project, say officials, might be extended beyond 2022. While celebrities did help popularise the movement, it did little to change people’s mindset. The roads swept clean were found to be just as dirty an hour later. The government recently decided to outsource the SBM publicity campaign to a professional agency for the next four years and has allocated about '200 crore for this. It remains to be seen how much this expensive campaign can achieve without first putting in place the mechanisms to maintain cleanliness. Yes, it is about mindsets, but shouldn’t we implement a comprehensive waste management policy before we set out for a dialogue with the common man about cleanliness?